The Greek Community of Melbourne in collaboration with the Greek Studies Program of La Trobe University, the Greek-Australian Cultural League and the Hellenic Writers Association of Australia are presenting the book “The Legacy of the Greek Language”, which was compiled and edited by Professor George Kanarakis OAM, from Charles Sturt University, on Sunday 30 April at the Greek Centre, Melbourne. Presenters of the book will be Dr Maria Herodotou, Coordinator of the Greek Studies Program, La Trobe University and Professor David Bradley, Professor of Linguistics, La Trobe University. The book launch will be held on Sunday 30th April, 2017, 3.00pm at the Greek Centre, Mezzanine Level, 168 Lonsdale St., Melbourne. The Legacy of the Greek Language (Peridot International Publications, New York, 2017, pp. 796), is a collective volume of thirty-six specialised studies by thirty-five noted scholars. Derived from primary research, this volume evidences the unique contribution made by Greek from antiquity to the present, initially to the languages of Europe and through them to many other languages of the world, as well as to the cultures of their peoples. To gauge the scale of the legacy of Greek, thirty languages are examined which extend geographically and culturally beyond Europe. Similar studies of some of these languages, including Korean, Chinese, Japanese, Afrikaans, and Swahili, have not been undertaken until now. 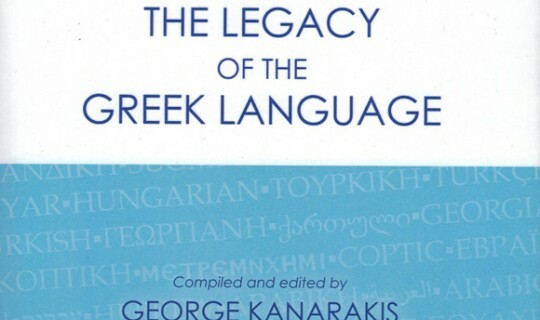 Combining theory and practice, this well-documented collective work is intended not only for experts in the theoretical and applied linguistic sciences and for educators in second or foreign language teaching and learning, but also for readers interested in the Greek language and its global presence. The Legacy of the Greek Language guides us to a journey across the world, expanding our knowledge and appreciation of the wealth and contribution of the Greek language. At the same time, it enhances our understanding of interlanguage contact and its impact within the multicultural reality of our times.